Udo Ulfkotte (20 January 1960 – 13 January 2017) was a German journalist and political scientist. He was an assistant editor for a German main daily newspaper, Frankfurter Allgemeine Zeitung for several years until 2003. Ulfkotte died from a heart attack on January 13 2017 at the age of 56. The English translation of the book is due to be published under the title Journalists for Hire: How the CIA Buys the News in May 2017. This entry was posted in BND, CIA, Germany, Journalism and tagged "How the CIA Buys the News", CIA, Journalism, Journalists for Hire, Media, Udo Ulfkotte. Bookmark the permalink. Thank you Udo Ulfkotte for your courage and truth telling. 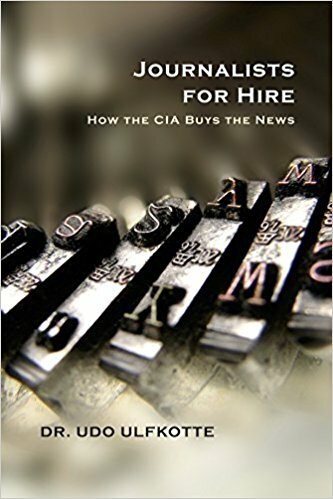 Eventually, the English language version of your book Journalists for Hire: How the CIA Buys the News will emerge and not cost $1309 a copy on Amazon! In the meantime, can someone post the contents of this book online? What is going on? Actually, my bookstore was not able to get this book. I will write them tomorrow asking for an explanation. Let us find out! Are you serious with this? Come on…. The English version was “Privished” that is were a book is privately published with a run of only a few copies. The English version is needed badly because the German version when translated by Google or other service the wording is really really bad and hard to understand so times. Translating also loses the format of the PDF or you have to format it into docx and it looks like crap. Udo Ulfkotte is died also. He dies supposedly of a heart attack. Which is typically the diaognoises when someone is murdered via a posion. The man routinely said he would be killed at some point and would never reach his senior years! As a leftist myself, I have found his investigations as very crediable do to the fact of him publishing his sources, which is easily verifiable even though many of the website links tend to be dead but you can use the way back machine to view the website pages he refers to. Many of the pages are government or NGO related. Those groups tend to publish their damaging info and when it is pieced together paints a murky underworld of journalism and Western politics! This not some infowars Alex Jones pushing super male vitality pills nosense!!!! This is the real deal here! The issues that Udo uncovers and shows everyone is NOT painted with partisan bs or bombastic statements coupled with showmanism sprinkled with lies and decite. He just tells you what he experienced while he did his job over the years and what he uncovered when he looked into who some people worked for.